Last week, a group of three companies, two in Panama and one in Barbados, disclosed they had bought a bit more than 10% of Pacific Rubiales Corp. The Panama companies were well anonymized, but the Barbados one less so. Alek Boyd said on Twitter April 28 that he got the paperwork for the Barbados company. It belongs, he says, to Alejandro Betancourt, chairman of Derwick Associates. 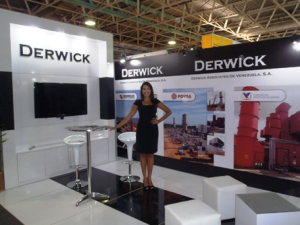 This was a surprise, given as I’ve covered each of those companies extensively and the last we heard, a top Pacific Rubiales executive was saying he didn’t know the Derwick guys. Yesterday, Anatoly Kurmanaev at Bloomberg reached Orlando Alvarado. Alvarado said he and some other Venezuelan investors who preferred to remain anonymous were behind the purchase. He said they were open to buying a bigger stake. While the Bloomberg story doesn’t make the link to Derwick, Alvarado shares a name with a board member of Derwick Associates. These new shareholders started the day with about US$100 million worth of Pacific Rubiales shares. Their little hint to the market spurred buying in the stock, driving up the share price almost 10%, for paper gains of about $10 million in a day. Meanwhile, a big decision came down in the case that Otto Reich filed against Betancourt, Pedro Trebbau and Francisco D’Agostino in US District Court in New York. (Note, I’m not a lawyer, this is a layman’s reading without consulting with anyone and I’ve made ignorant errors in the past. So don’t count too heavily on this article.) The court previously dismissed the racketeering and civil conspiracy claims. 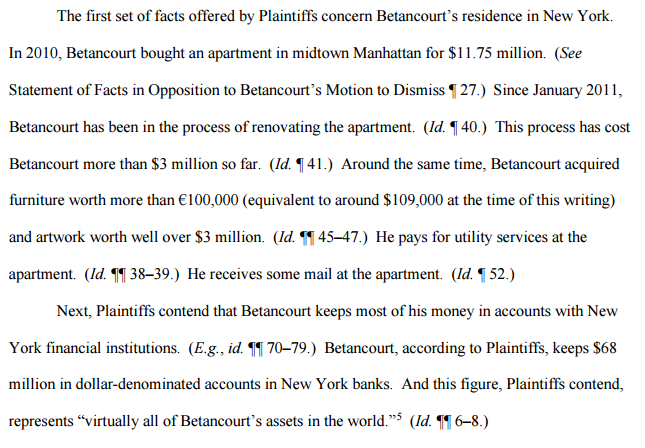 The remaining claims, basically defamation, had tougher standards of jurisdiction — the plaintiffs needed to prove that Betancourt and Trebbau were “domiciled” in New York. That fight has been going on since August. Yesterday, the judge decided that Betancourt and Trebbau weren’t domiciled in New York and could be free of the suit. In an article on the decision in the Wall Street Journal, Reich’s lawyer said the case goes on against the third defendant, D’Agostino, and that Reich has moved to reinstate racketeering allegations. Reich’s new proposed motion, filed into the docket April 27, spells out more clearly allegations of wire fraud and racketeering. So after two years, it’s still a wait-and-see. But for now, Betancourt, Trebbau and their team of lawyers and PR people must be pretty happy. Meanwhile, Venezuela is living through an even worse electricity crisis than 2010. Last time, the crisis was an opportunity for Derwick and others to receive power plant procurement deals which had, according to leaked documents, what appear to be tremendous markups. That situation led eventually to everything in this article. But with the petrostate piñata nigh empty, this time, I don’t know who’s going to even claim to fix Venezuela’s electricity situation. Entonces este Betancourrt tiene una fortuna de casi 200 millones de dolares. Viene de una familia de gente rica? Invento una application “roja rojita”?